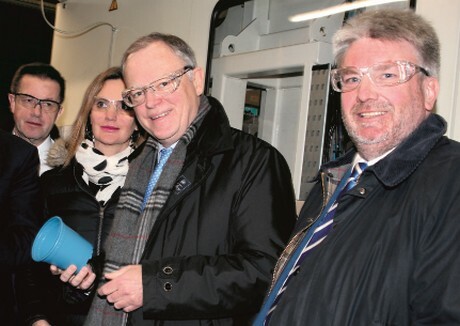 During a visit to Lohner company Pöppelmann on Monday the 14 th of January, Lower Saxony's Prime Minister Stephan Weil was impressed by the success of the plastics processor in the use of recyclates from the recycling bag. On site, he took a look at the production of the blue recycled plant pot. Here, Sven Hoping, Global Sales Manager of the Pöppelmann TEKU® Division, explained: "We are firmly convinced that the future for the plastics industry lies in the circular economy." The head of state used the private meeting of his cabinet on Monday and Tuesday in neighboring Dinklage for a quick visit to the Lohner headquarters on Bakumer Straße. 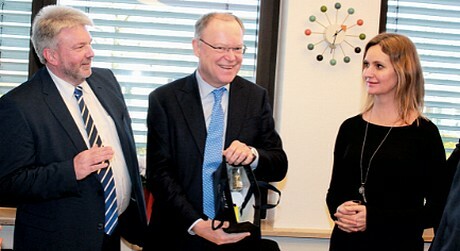 Torsten Ratzmann, CEO, was very pleased that Weil accepted the invitation he had given some time ago. At the welcoming ceremony, the Pöppelmann managing director affirmed: "Pöppelmann has an international presence. But by far our largest and most important location remains Lohne - and thus Lower Saxony. " In addition to Stephan Weil, the group of visitors also included the members of the state parliament. Stephan Siemer (CDU) and Deniz Kurku (SPD), Lohner Mayor Tobias Gerdesmeyer, District Administrator Herbert Winkel and Kristian Kater as district chairman of the SPD, as well as Werner Steinke as a representative of the Lohner SPD local chapter. Mayor Gerdesmeyer had brought the golden book of the town Lohne. Benjamin Kampmann of the Pöppelmann Innovation Management informed the guests about the company-wide initiative 'PÖPPELMANN blue®'. Its goal was to make the plant pot production in the Pöppelmann TEKU® division use only 100 percent recycled material by 2025. Günther Orschulik, head of TEKU® product management, added: "In order to put the concept of recycling into practice seriously and completely, two aspects are crucial: the use of 100 percent recycled material and the guarantee that the products are 100 percent recyclable." Another topic of discussion during the visit of the Prime Minister was the training and the needs of the company for skilled workers. Personnel Manager Alexandra Dantmann said: "In times of full employment, recruitment is becoming increasingly difficult. We do score well with a sustainable training concept, which is wide-ranging across all four divisions. This offers our trainees and students a promising career."